Learn first-rate techniques and tips from some of the best makeup artists in the business in the new edition of The Makeup Artist Handbook. 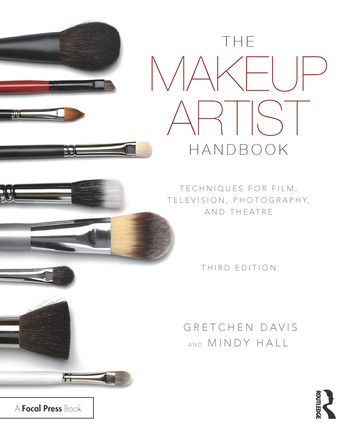 Renown makeup pros Gretchen Davis and Mindy Hall bring an impressive set of experience in all areas to the book, including work on Teenage Mutant Ninja Turtles, Steve Jobs, The Wolf of Wall Street, Blue Jasmine, Star Trek, Pearl Harbor, HBO’s Looking and many other films and TV shows. This full-color, comprehensive new edition offers brand new photographs and on-the-job examples to demonstrate makeup techniques and fundamentals on topics such as beauty, time periods, black and white photography and up-to-date information on cutting-edge techniques like computer-generated characters, makeup effects, mold-making, air brushing, and plenty of information on how to work effectively on set. GRETCHEN DAVIS is a freelance Makeup Artist and writer. A 2012 Primetime Emmy Nominee for Makeup on Hemingway and Gelhourn, HBO, her long and vast experience in film, television, photography, and digital media also includes the creation of the makeup course at The Academy of Art, San Francisco. She is highly sought out after to work with high profile clients that include Paramount, Disney, DreamWorks, Universal, HBO, Pixar, and ILM. Visit her at www.gretchendavis.com. MINDY HALL is an award winning Makeup Artist and Consultant whose career spans more than 30 years in film, television, print, theatre, and designs for Broadway. She is a 2010 Academy Award winner for Best Makeup and the 2010 Saturn Award for Best Makeup for Star Trek, Paramount Pictures, a 2011 Primetime Emmy Nominee for HBO’s Cinema Verite and a winner of 2004 Hollywood’s Makeup Artist and Hairstylist Guild Award for the Broadway show Wicked. Visit her at www.mindyhall.com.